Vignan University, Guntur offers admission to 4 years Bachelors of Technology (B.Tech) program for the commencing session 2018. Vignan's University conducts Vignan Scholarstic Aptitude Test 2019 - VSAT 2019 Online Test for B.Tech admission. 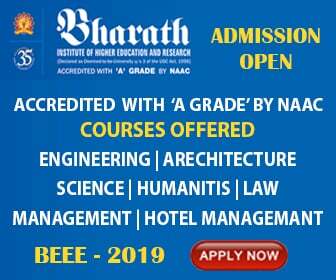 Candidates born on or after 01st July 1998 and a pass in above Intermediate or its equivalent with minimum B2 grade/ CGPA of 7.0 in Andhra Pradesh or above 60% aggregate marks in Telangana State are eligible to appear for the admission test. Admission to B.Tech./ B. Pharm Programs will be through Vignan's Scholastic Aptitude Test, V-SAT an online test, conducted by Vignan's Deemed to be University on all India basis. Candidates qualified in AP or TS EAMCET/ JEE(Mains)/ JEE(Advanced) with a minimum of B2 grade/ CGPA of 7.0 in Andhra Pradesh or above 60% aggregate marks in Telangana State in the +2/ Intermediate Exam. Candidates who attempt Physics, Chemistry, Biology and English/Aptitude in the V-SAT 2019 are eligible for B.Tech. Biotechnology, Bioinformatics, Biomedical Engineering, Food Technology and B.Pharmacy Programs.